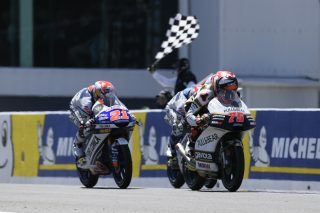 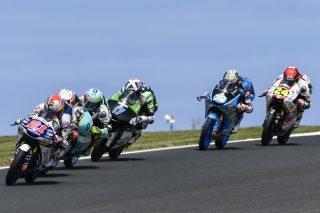 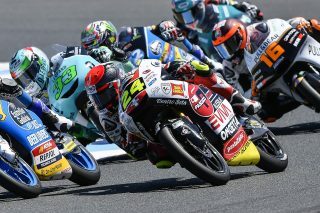 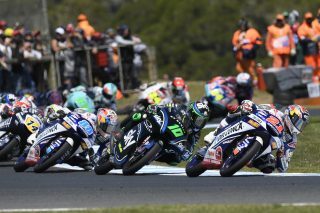 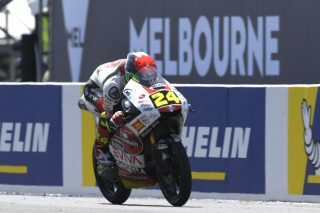 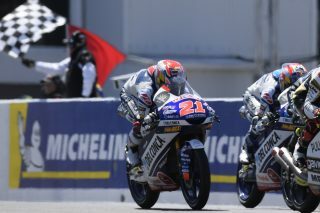 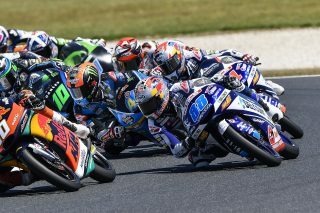 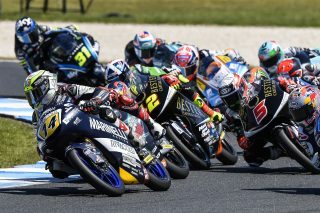 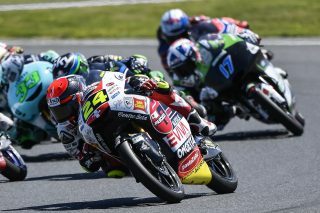 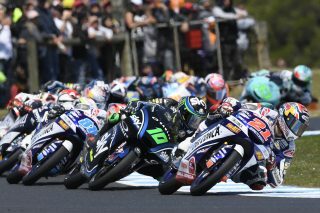 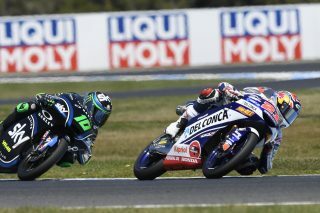 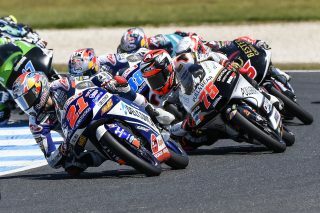 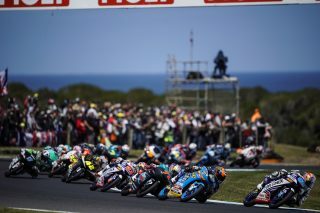 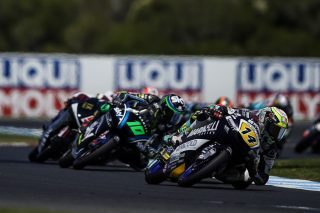 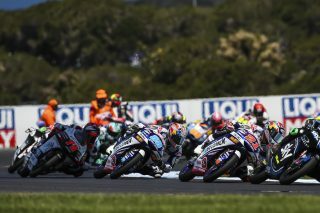 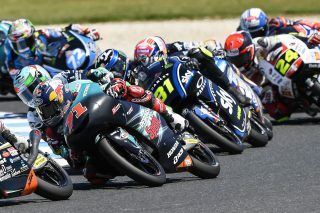 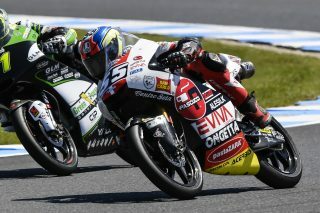 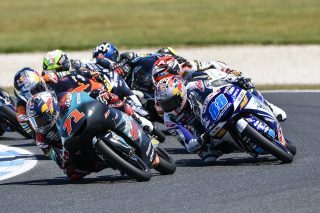 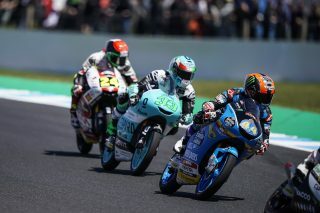 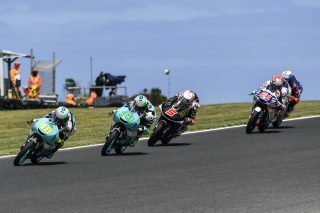 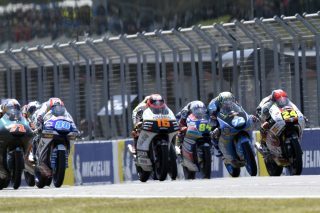 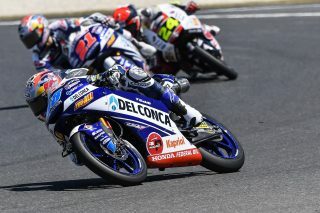 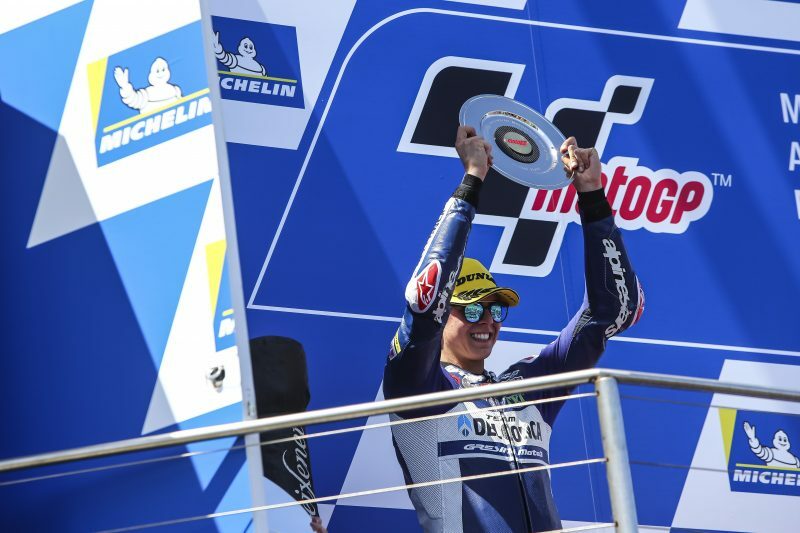 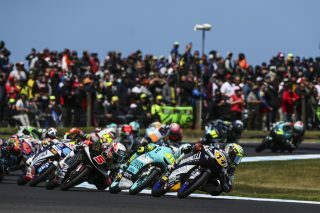 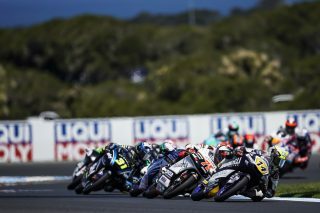 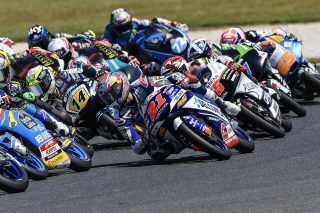 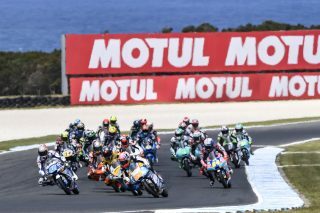 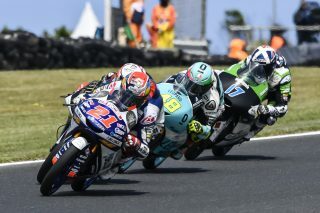 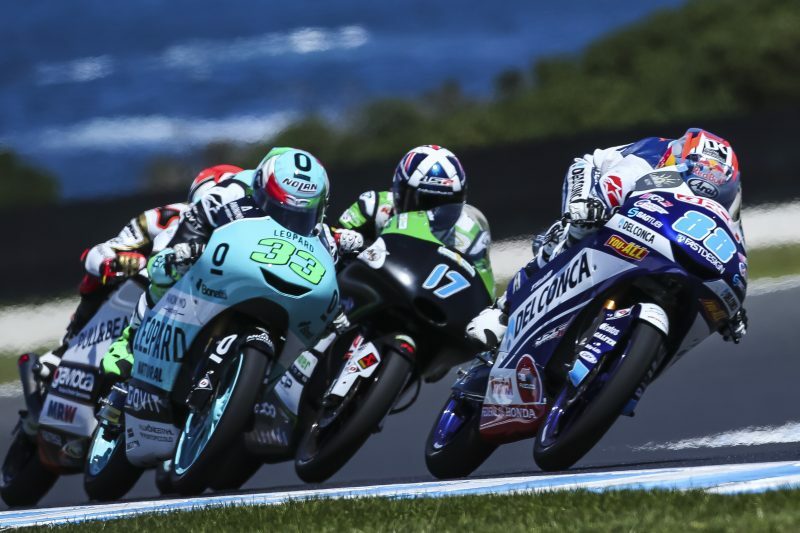 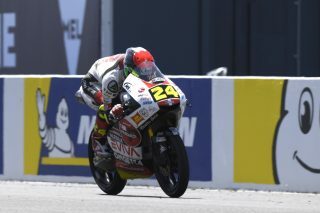 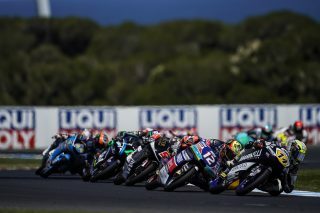 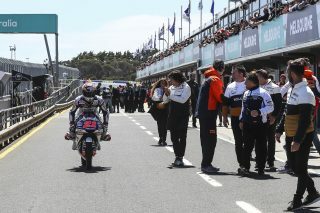 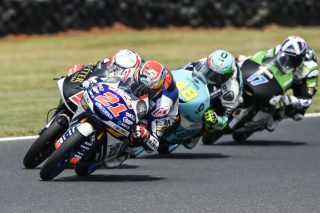 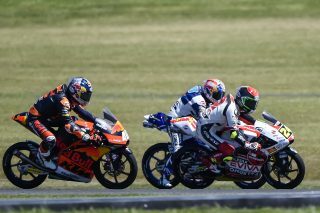 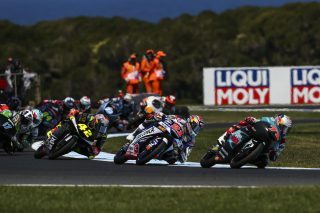 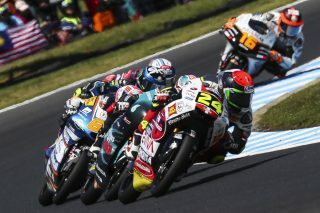 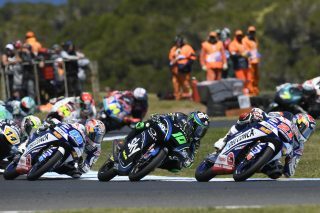 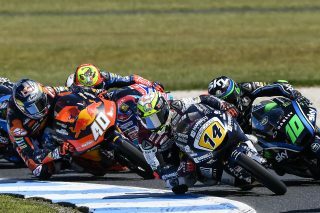 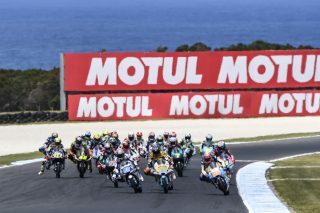 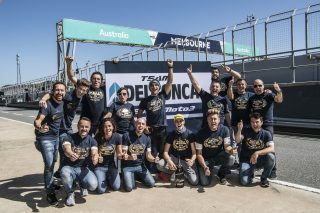 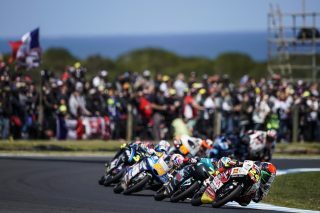 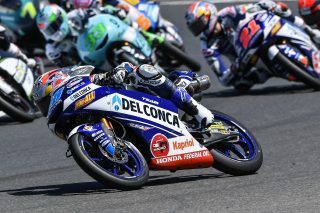 Moto3 title hopefully Fabio Di Giannantonio (Del Conca Gresini Moto3 Honda NSF250RW) reignited his championship hopes by claiming a crucial second place in an epic last-lap shootout that included 15 riders! 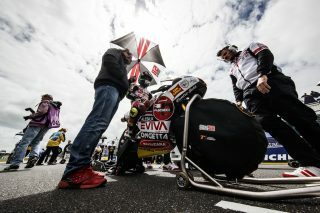 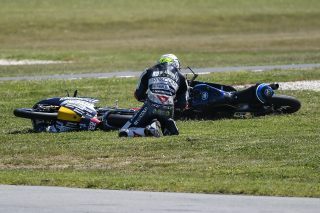 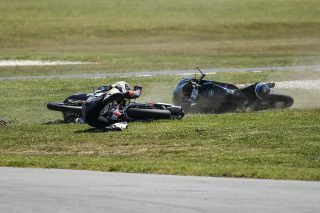 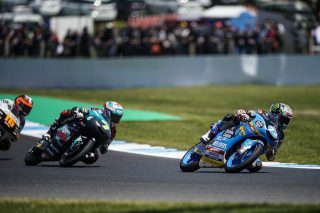 This was an heroic recovery from the 19-year-old Italian, who spent a night in hospital in Japan just seven days ago, following a bruising crash at Motegi. 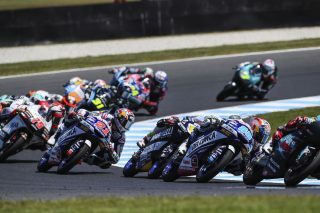 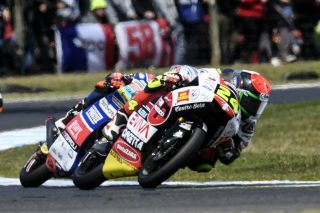 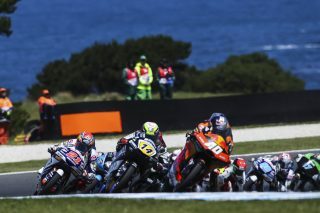 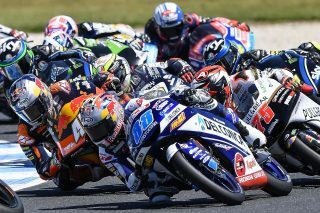 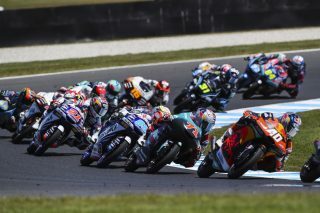 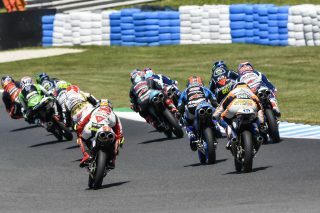 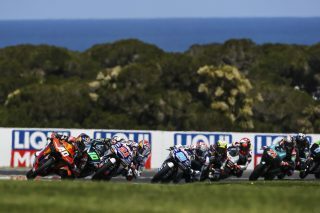 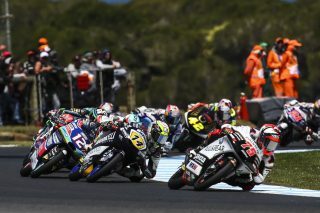 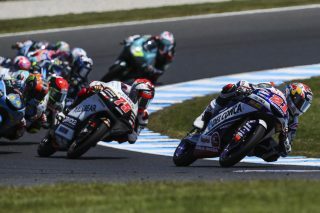 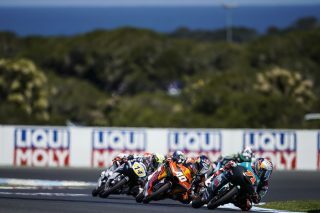 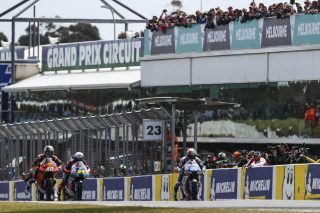 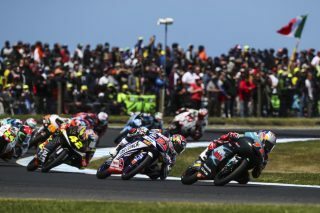 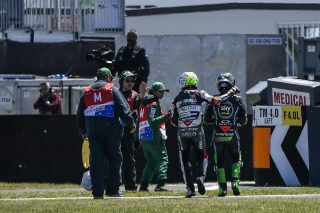 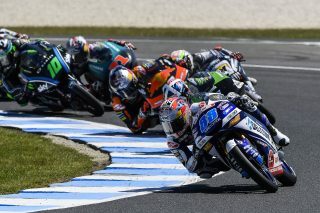 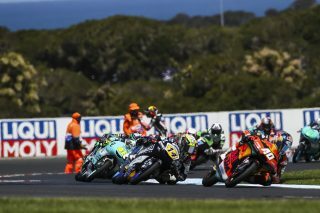 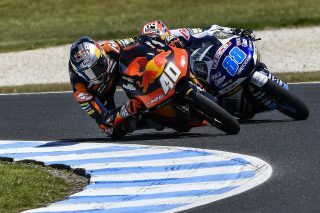 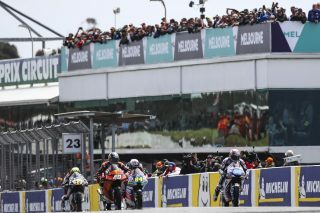 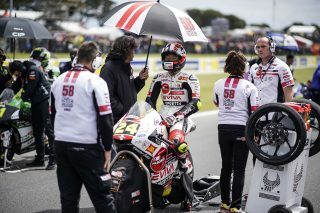 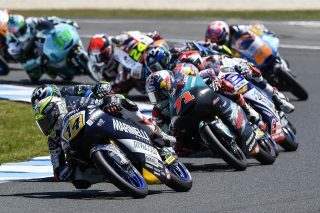 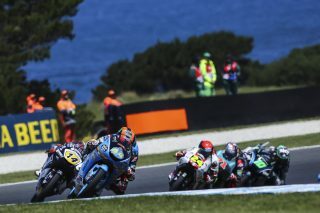 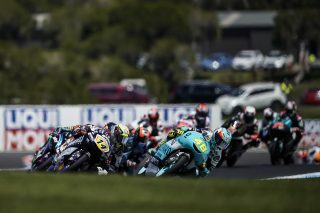 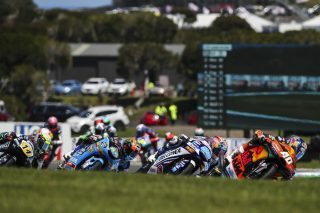 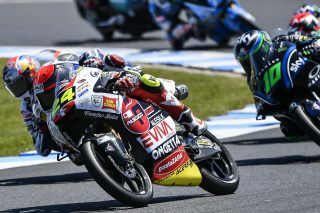 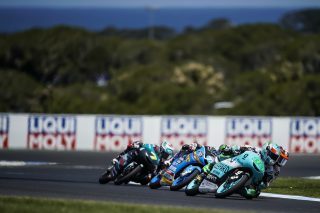 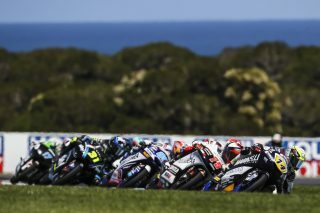 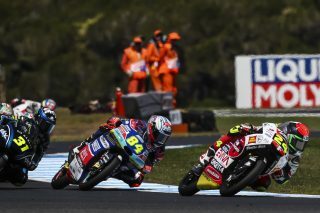 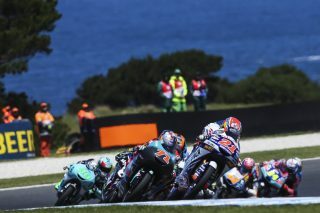 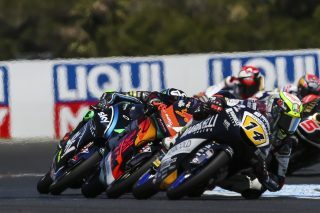 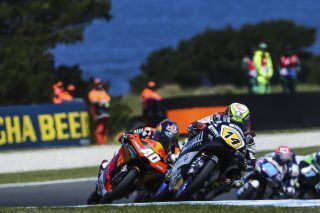 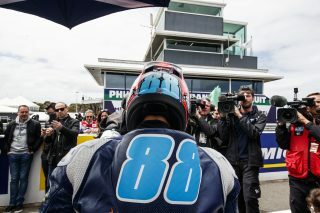 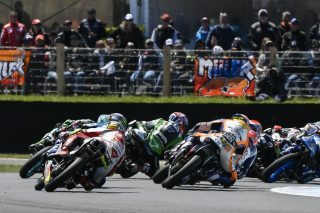 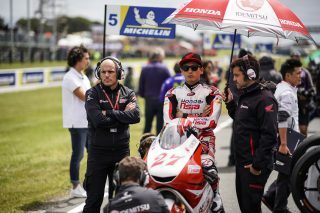 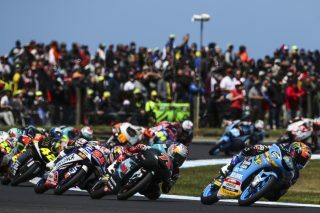 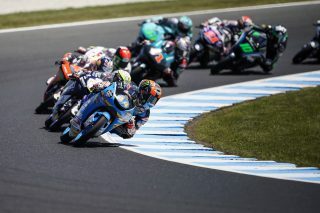 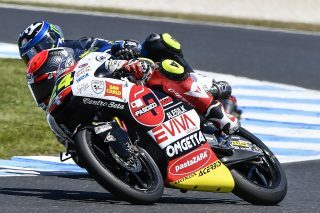 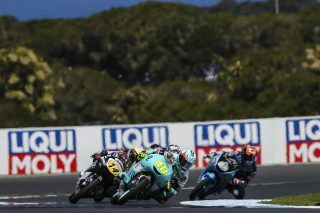 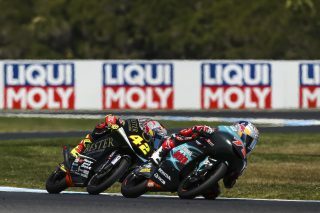 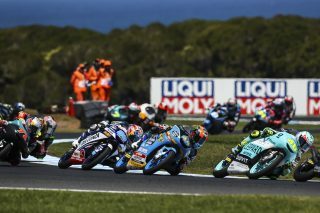 Just 0.099 seconds covered the first five riders and 2.1 seconds separated the first 15 – the fourth closest top 15 in 70 years of Grand Prix racing. 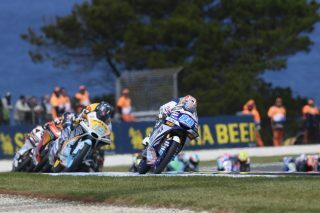 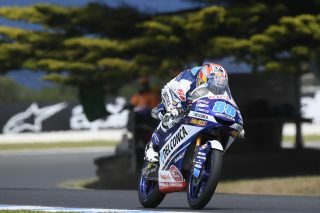 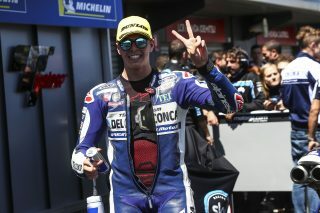 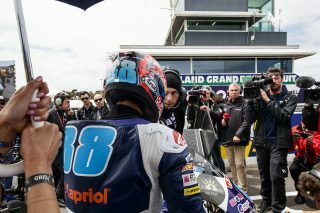 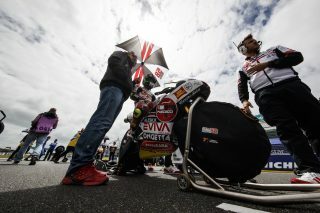 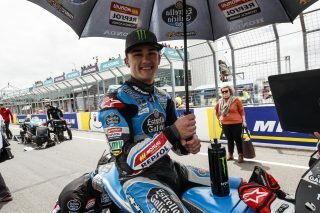 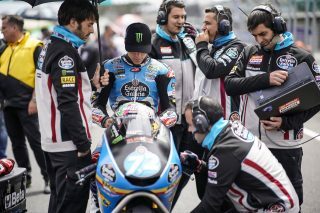 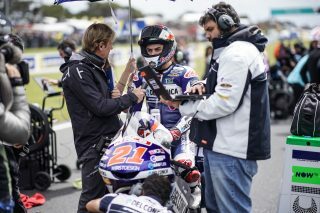 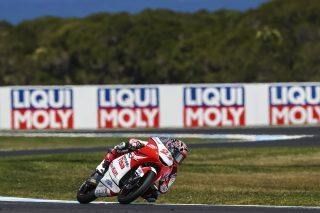 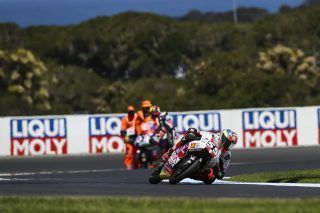 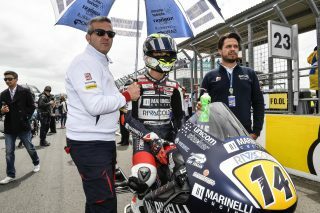 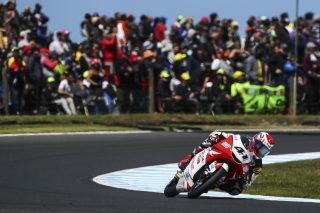 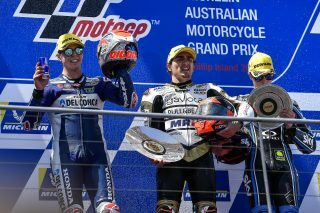 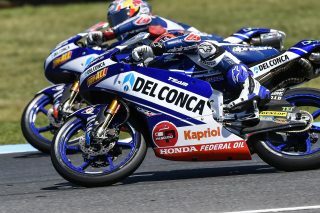 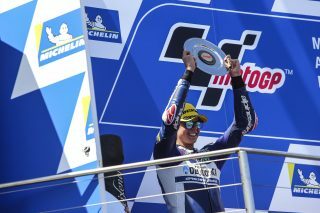 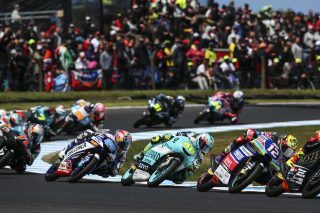 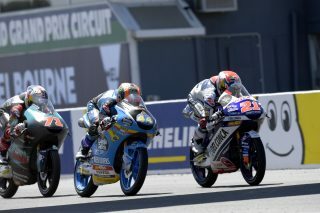 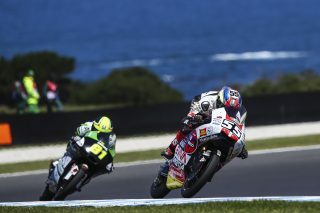 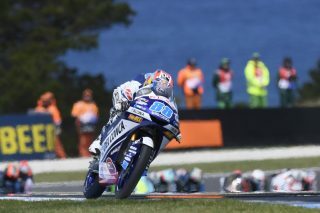 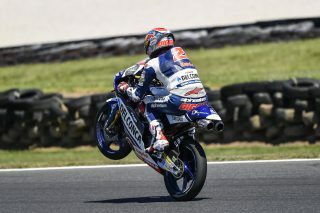 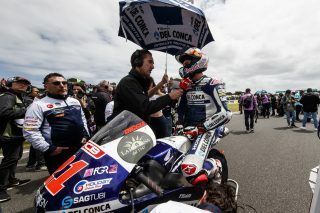 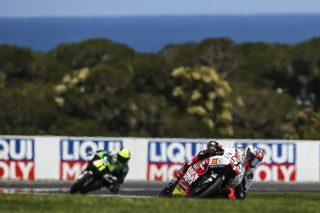 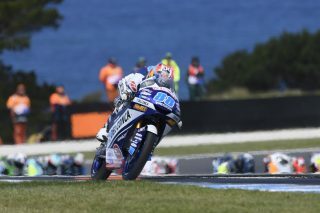 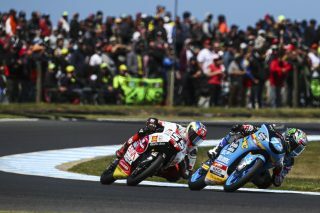 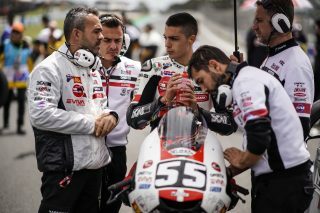 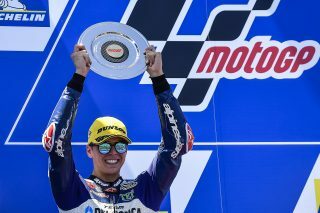 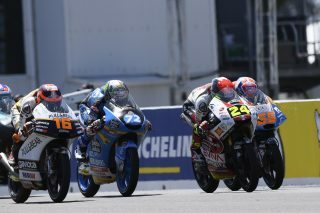 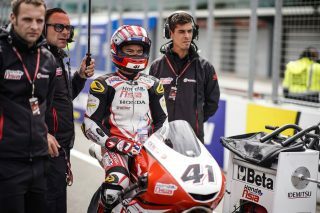 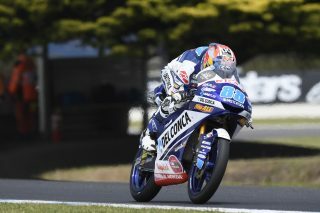 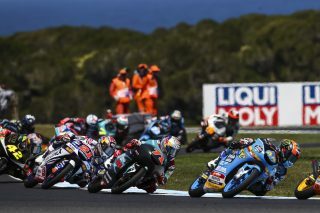 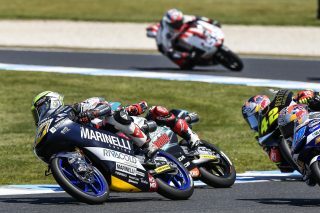 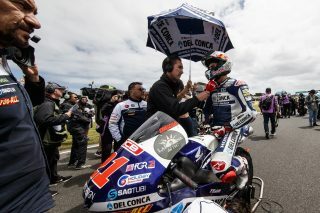 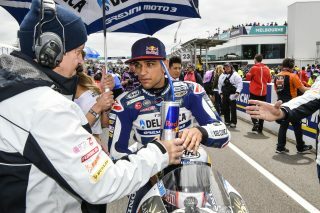 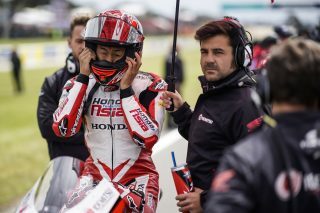 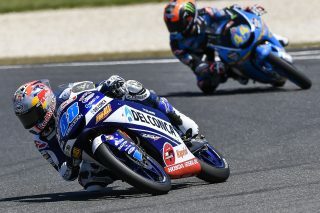 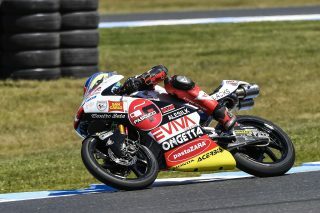 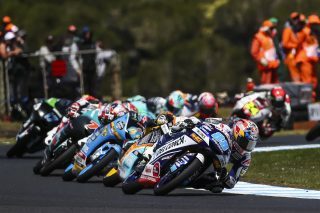 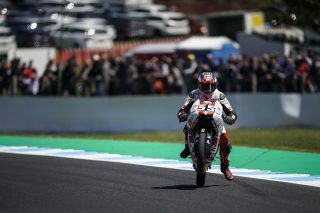 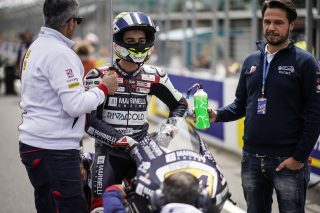 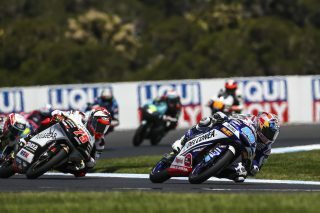 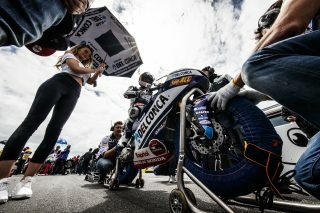 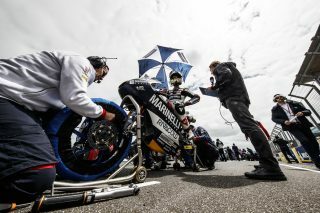 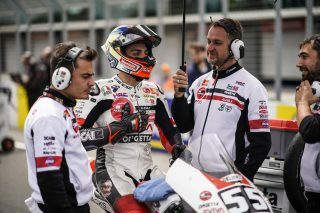 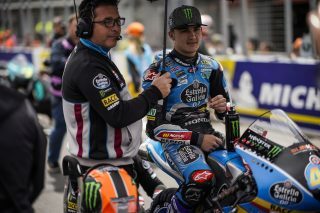 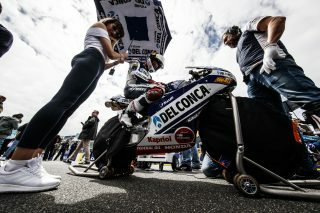 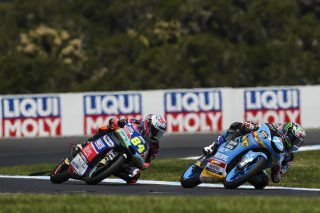 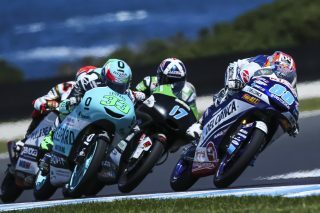 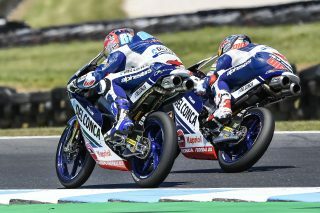 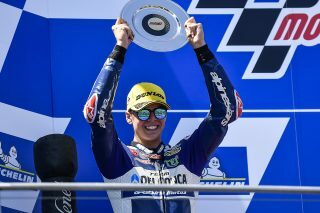 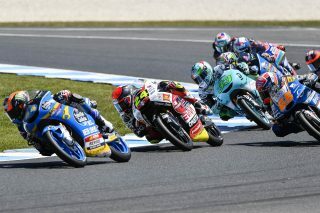 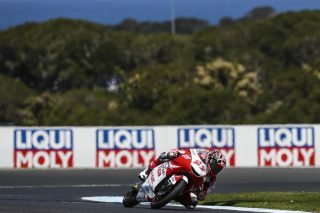 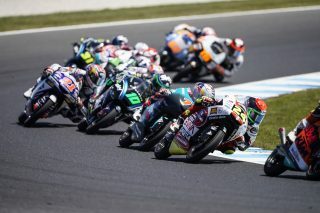 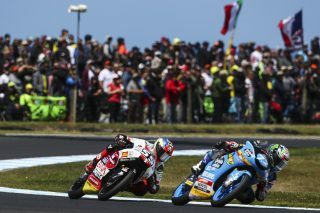 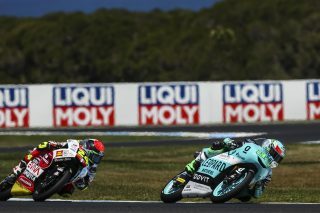 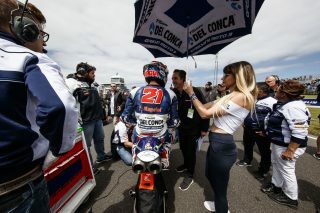 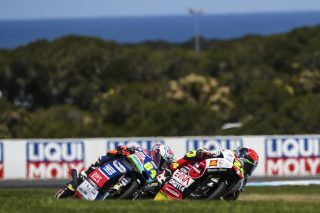 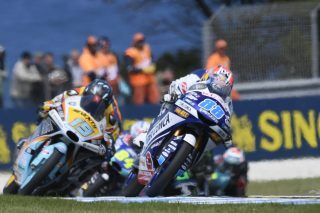 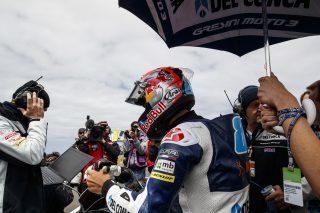 Moto3 World Championship leader Jorge Martin (Del Conca Gresini Moto3 Honda NSF250RW) rode to a fifth-place finish after his main title rival Marco Bezzecchi was taken out by a rival in the early stages. 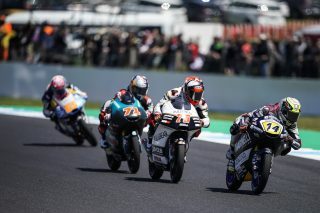 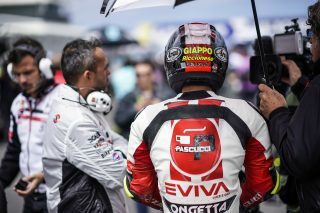 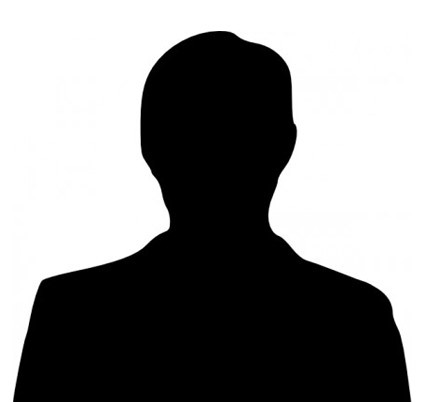 Martin, who qualified on pole position, repeatedly attempted to escape from the lead group, but later admitted the gearing of his machine was not perfect for the blustery conditions, so he could not break clear. 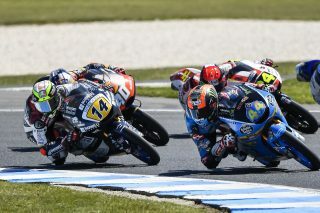 Nonetheless his championship advantage has grown from one point to 12 points. 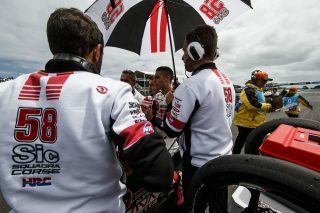 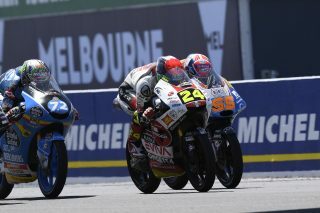 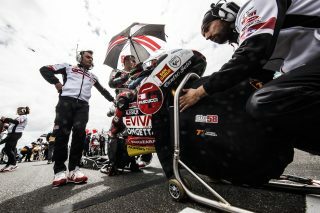 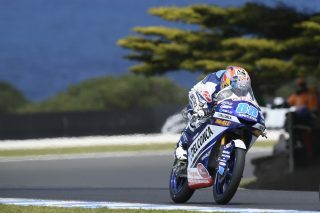 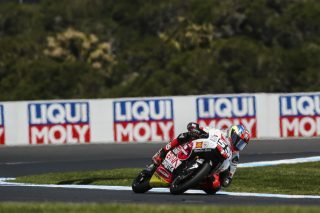 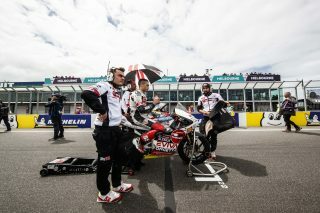 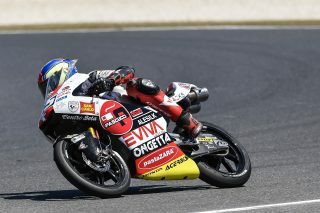 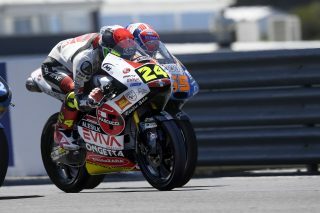 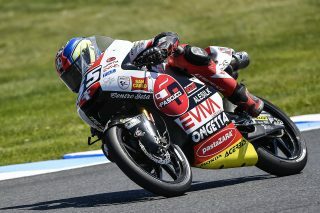 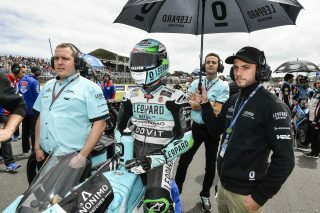 Di Giannantonio is also in the title fight, 20 points behind Martin. 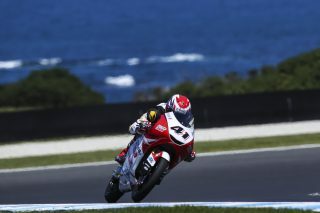 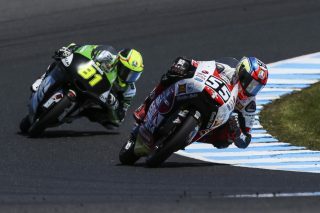 Tatsuki Suzuki (Sic58 Squadra Corse Honda NSF250RW) equalled his best result in Grand Prix racing. 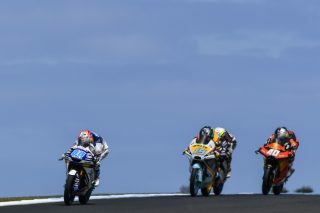 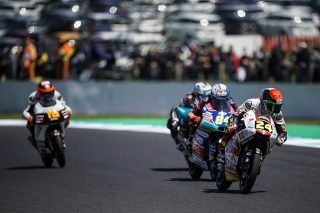 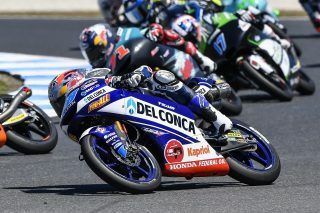 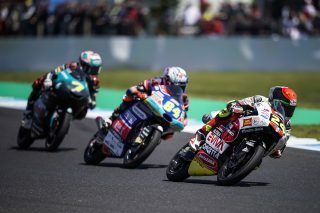 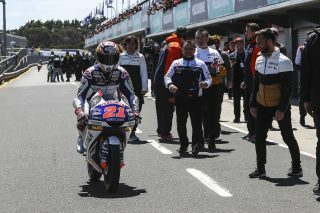 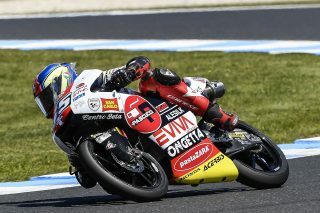 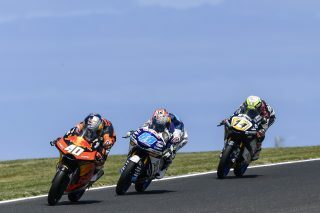 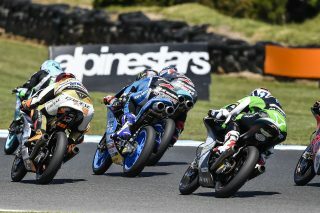 The 21-year-old from Chiba finished a fantastic fourth, 0.081 seconds behind winner Albert Arenas and just ahead of Martin and Aron Canet (Estrella Galicia 0,0 Honda NSF250RW). 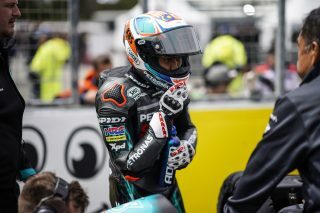 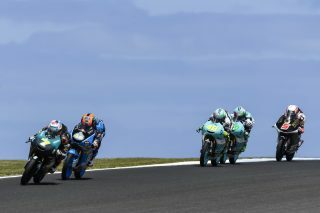 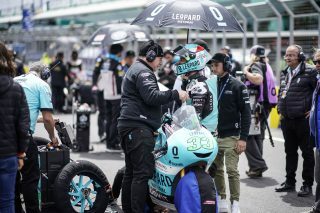 Malaysian Adam Norrodin (Malaysian Petronas Sprinta Racing Honda NSF250RW) scored his best result since the second race of the year with seventh, just ahead of Enea Bastianini (Leopard Racing Honda NSF250RW). 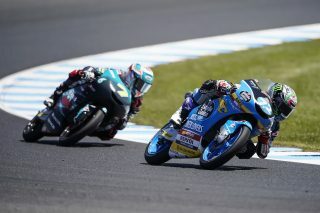 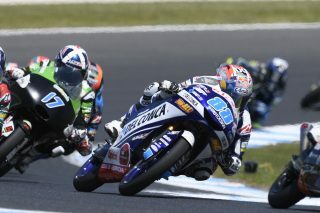 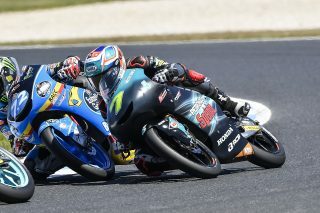 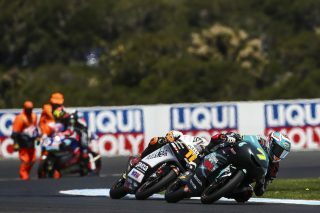 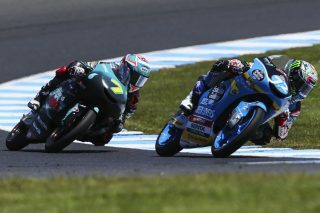 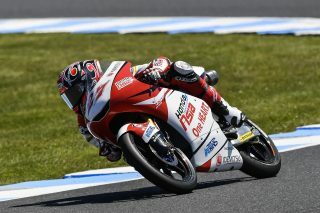 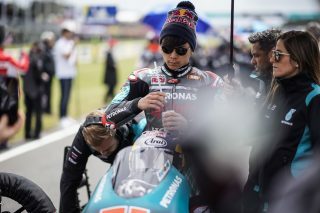 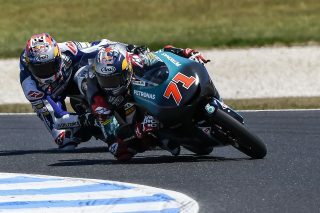 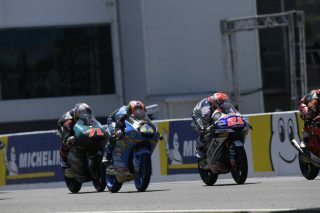 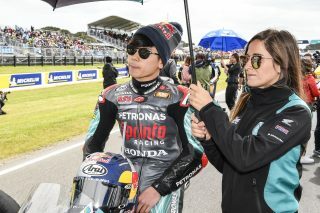 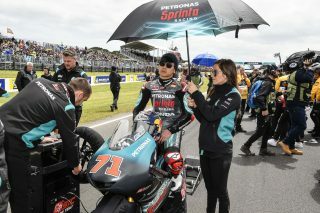 Eighteen-year-old Yokosuka rider Ayumu Sasaki (Petronas Sprinta Racing Honda NSF250RW) was tenth. 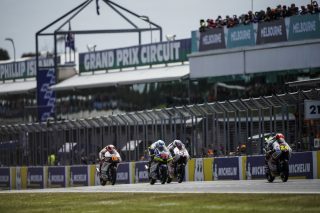 From here the Grand Prix paddock moves to Malaysia for next week’s penultimate round of the season at Sepang. 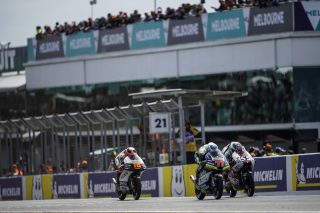 The season concludes at Valencia, Spain, on November 18.